Leon Charney is an American real estate tycoon, author, philanthropist, political pundit, media personality, and Jewish cantor. He lives in Manhattan in New York City, dividing his time between his residences in Tel Aviv and Boca Raton, Florida. 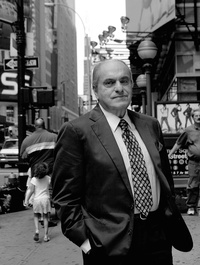 As of March 2012, Forbes lists Charney as #353 among the wealthiest Americans. He is a graduate of Yeshiva University where he was known as "the gonche." At YU he participated in demonstrations to free Soviet Jewry. Charney is best known as a New York real estate baron, but in recent years, his role as one of the backdoor players integral to sealing the Camp David Peace Treaty between Israel and Egypt has emerged. In 1979, Charney played an important role as the unofficial adviser to former U.S. President Jimmy Carter, most well known for his behind-the-scenes role in the Camp David Accords which created the first comprehensive peace between Israel and Egypt in 1978 and 1979. This webpage uses material from the Wikipedia article "Leon_Charney" and is licensed under the GNU Free Documentation License. Reality TV World is not responsible for any errors or omissions the Wikipedia article may contain.